This recipe was such a great way to make lots of food all at once. 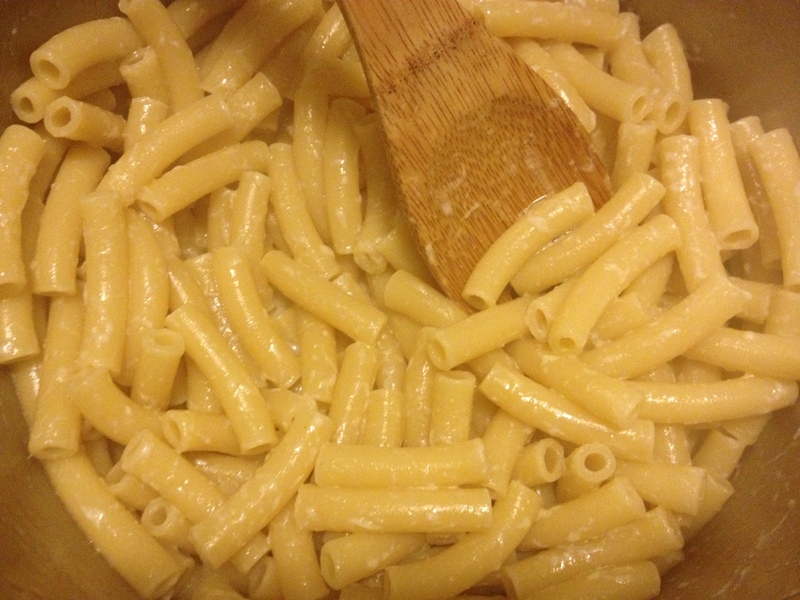 The pound of pasta easily makes 10 servings when you serve a vegetable on the side. It is rich and delicious and is sure to be a family favorite. 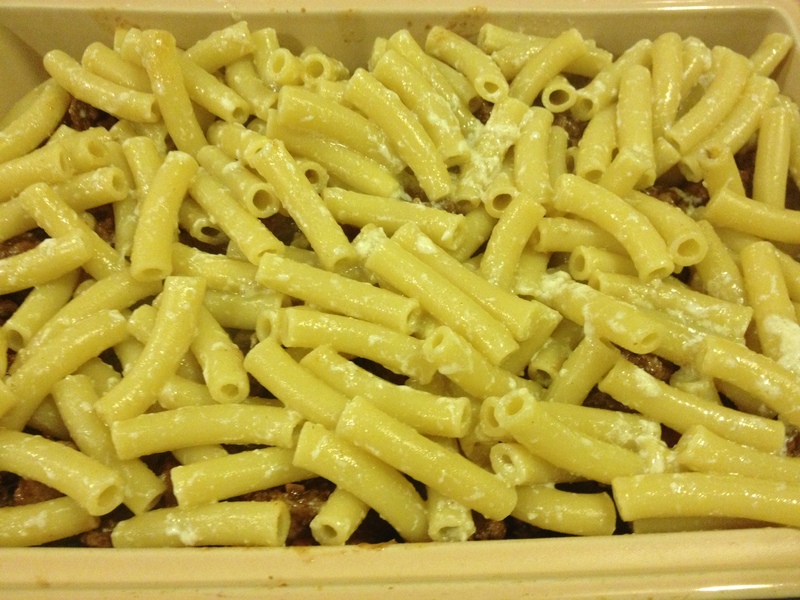 The bechamel sauce on tops makes for a beautiful, brown topping over the pasta. It might look like a complicated recipe, but it is really just 3 sections…the meat sauce, the bechamel and the pasta itself. Don’t let the multiple parts overwhelm you as you can do them all very quickly. The first step is to start heating your pasta water. Be sure to add plenty of salt! Put your five cups of milk in a pot and begin to heat over medium-high heat. Be sure to keep an eye on it so it doesn’t scorch! Heat a large skillet over medium high heat. Add a drizzle of olive oil. Once the oil is hot, add the onions. 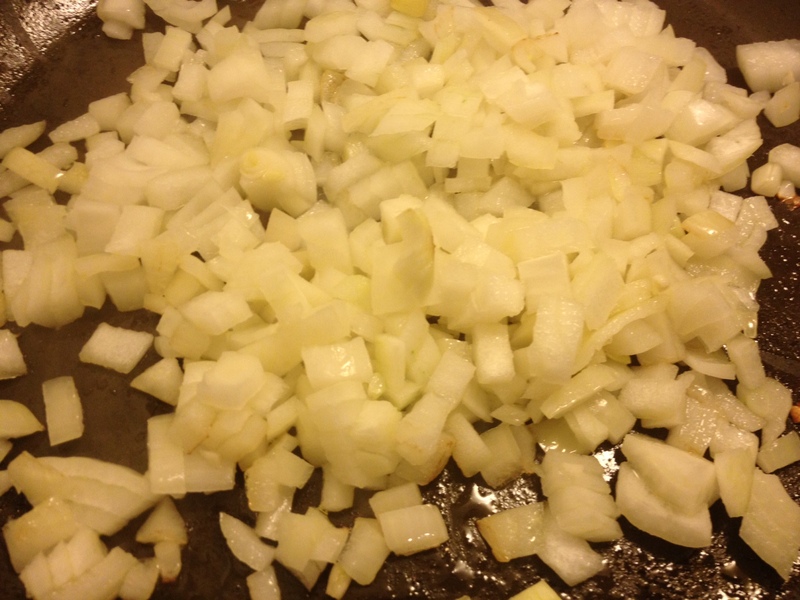 Cook onions for about 5 minutes until they start to become translucent. 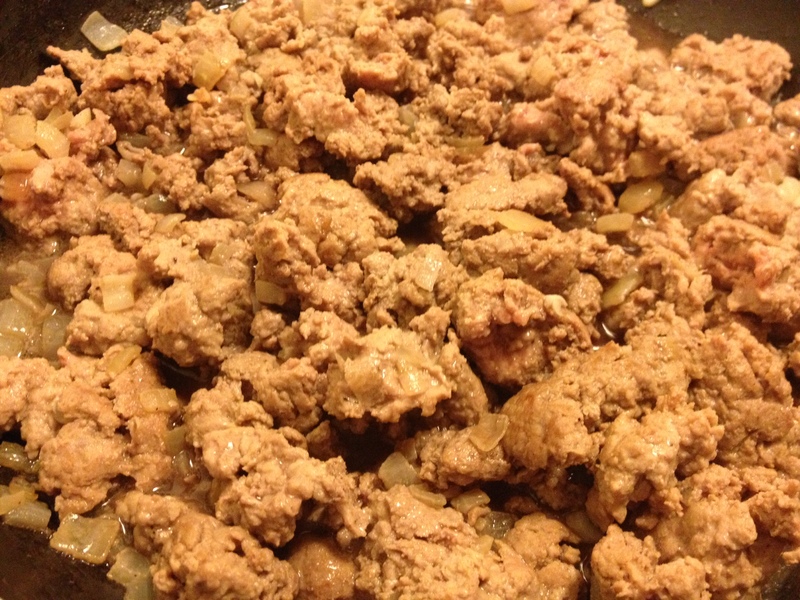 Add the ground turkey and garlic to the pan. Cook until turkey is browned. 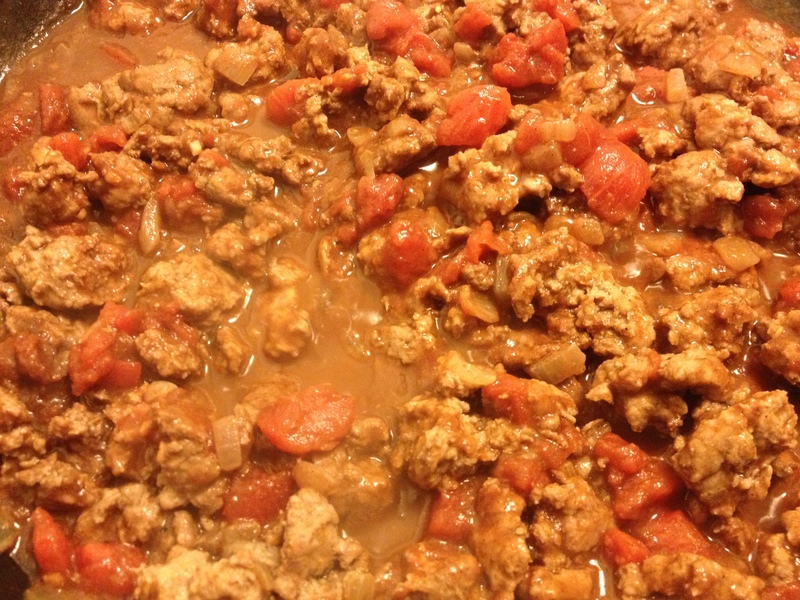 Add the red wine, tomatoes, tomato paste, cinnamon and allspice. Bring to a boil, then reduce heat and simmer about 25 minutes. 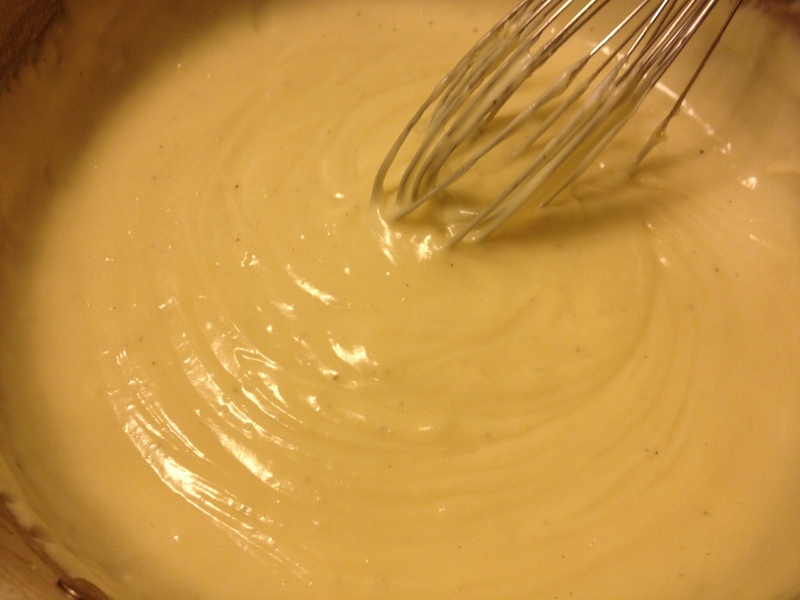 While the sauce is cooking, start your bechamel. Tip: Your water should be close to boiling now. Once it is, add your pasta and cook as directed. Add the flour and whisk. Add the scalded milk and whisk until smooth. 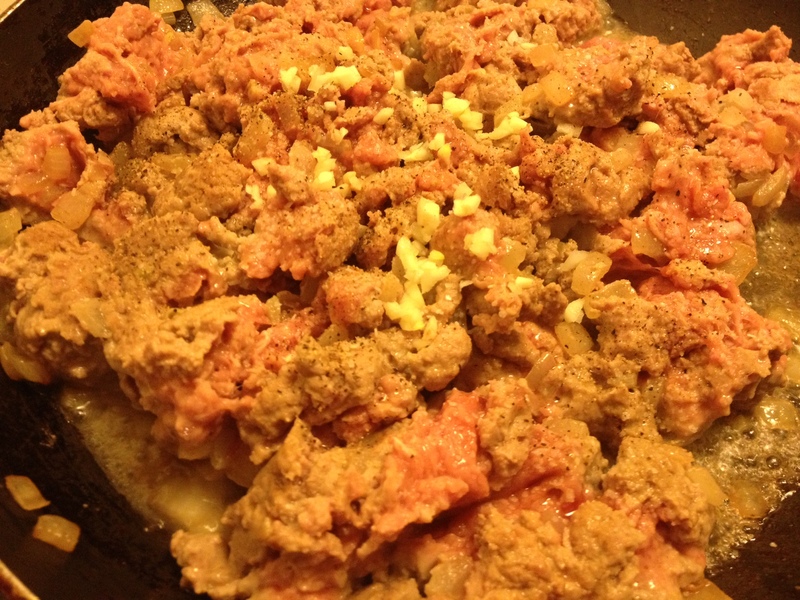 Remove sauce from heat and add parmesan, egg yolks, nutmeg and salt and pepper. Stir to incorporate. Tip: Sauce should be thick enough that it covers the back of a spoon. Pasta should be done by now. Drain. Add egg whites, a drizzle of olive oil and parmesan to pasta. Stir to incorporate. 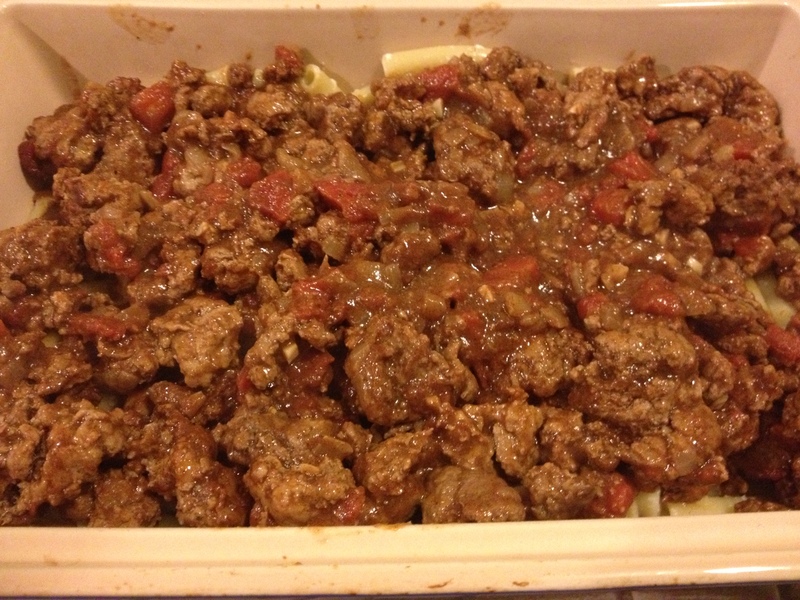 Layer the sauce on the bottom of a large casserole dish. Add the noodles on top of the sauce. 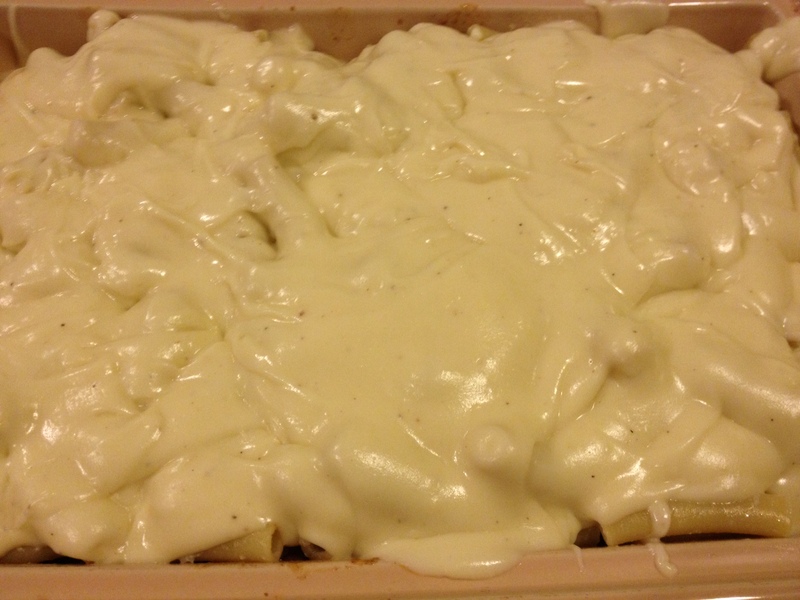 Cover the noodles with the bechamel sauce. Bake this in the oven for 45 minutes until top is golden brown. Enjoy! This was a hit in our household all around! It has been a couple of days since my last post…sorry, I was in a sort of food coma after the wonderful dinner on Thursday evening! This menu is one of my favorites so far. 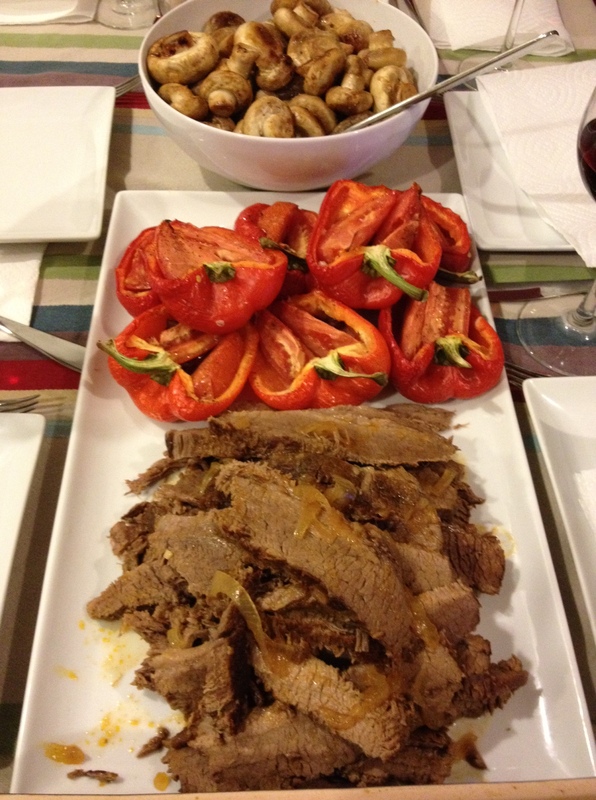 The brisket was a great center of the meal, but all the fresh veggies on the side put it over the top. I was also surprised at how quickly the meal came together. Any time I cook for a group, I always like to cook extra to make sure I have a couple of meals left over. All-in-all, the food made about 9-10 servings of food, which is great. 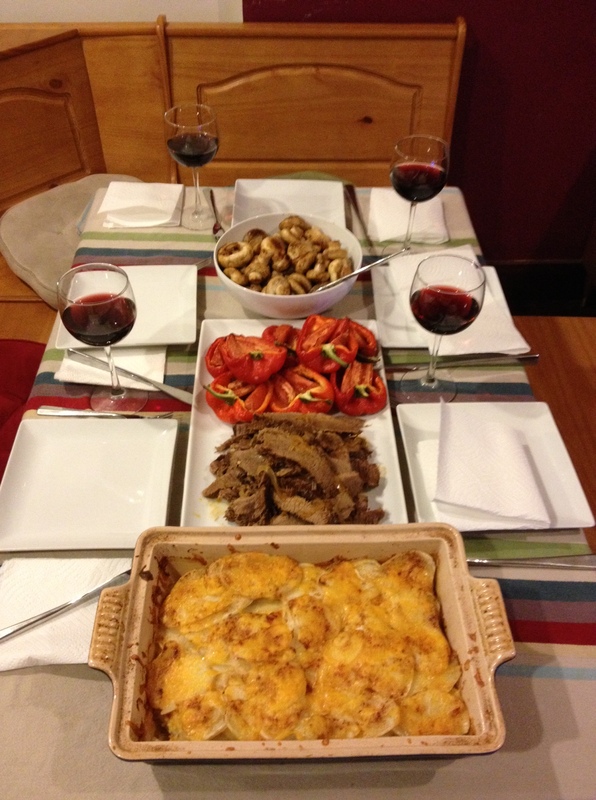 I was able to feed the 6 people at the dinner party and have lunch the next day! The brisket recipe I used made one of the best briskets I have ever had. 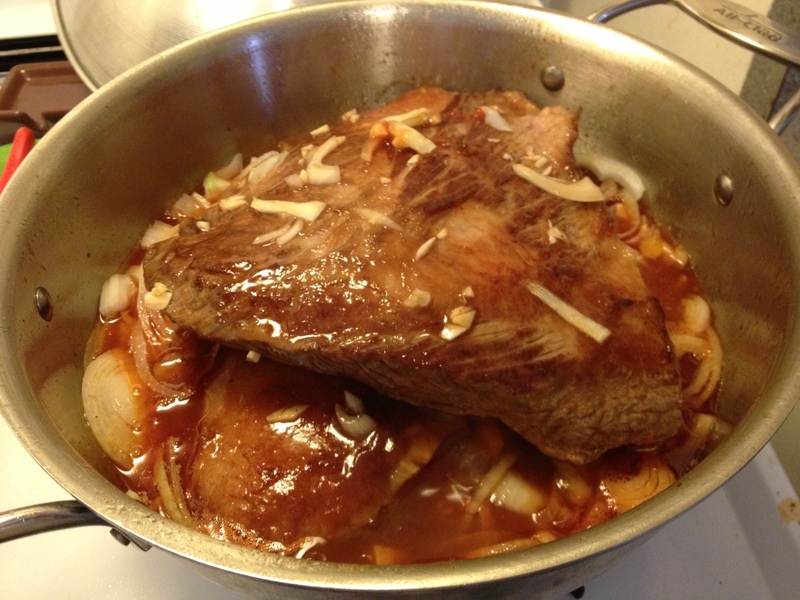 It was labelled as “Sweet and Sour Brisket” which sounded interesting….plus, it had almost 5 stars. When selecting recipes, I never choose below 4 stars. That usually eliminates a lot of the mediocre recipes. I started with a 5 pound brisket. Any time you cook large hunks of meat, you always want to sear it first. This helps give the meat a nice, brown outside and it helps to lock in the juices. So, I cut my large, flat 5 pound brisket into 2 equal pieces and seared each side in separate skillets. I seared one half in a dutch oven that I later used to cook the meat over low heat for several hours. Tip: To properly sear meat, heat oil over high heat in a skillet. Add the meat and cook about 5 minutes. You’ll know it’s properly seared when the meat can be pulled up without sticking to the skillet. If it sticks, give it a few minutes more. Mix the following ingredients in a large bowl: 1 cup water, 1 cup ketchup, 1/2 cup apple cider vinegar, 2 onions (sliced), 2 garlic cloves (minced), 3/4 cup brown sugar, 1 tablespoon salt. Put both halves of the meat in a large pot or dutch oven (I prefer the dutch oven). Add the ingredients you mixed in the bowl. Cover and reduce heat to low. Cook on the stove for 2 1/2 hours. Tip: Since I had two pieces stacked on top of each other, I rotated the pieces every half hour to ensure both pieces were cooked equally. Also, make sure the each piece is placed fat side up. This brisket recipes is great because it only takes about 10 minutes of prep, then it just sits and cooks for 2 1/2 hours (and you can get busy working on the side dishes)! The next dish I tackled was the scallop potatoes. These take the second longest to cook so you want to get them in the oven about an hour before the brisket finishes. 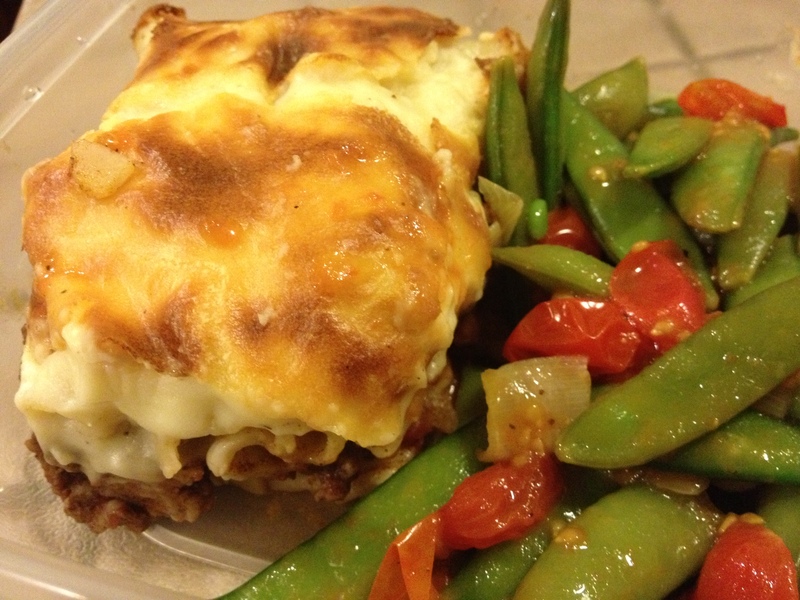 This is a delicious dish that is easy to throw together. Always a hit! The longest part of the whole process is prepping the potatoes. I used a 5 pound bag of russet potatoes. Peel all the potatoes and slice them very thin. If you have a mandolin, I recommend using it. Or use a food processor. If you don’t have either of these and have to do it by hand, just do your best to cut each slice the same width. This will ensure that all the potatoes are cooked evenly. Once potatoes are sliced, melt 6 tablespoons butter in a large skillet. Tip: For a healthier option, mix 3 tablespoons of butter with 3 tablespoons of olive oil. 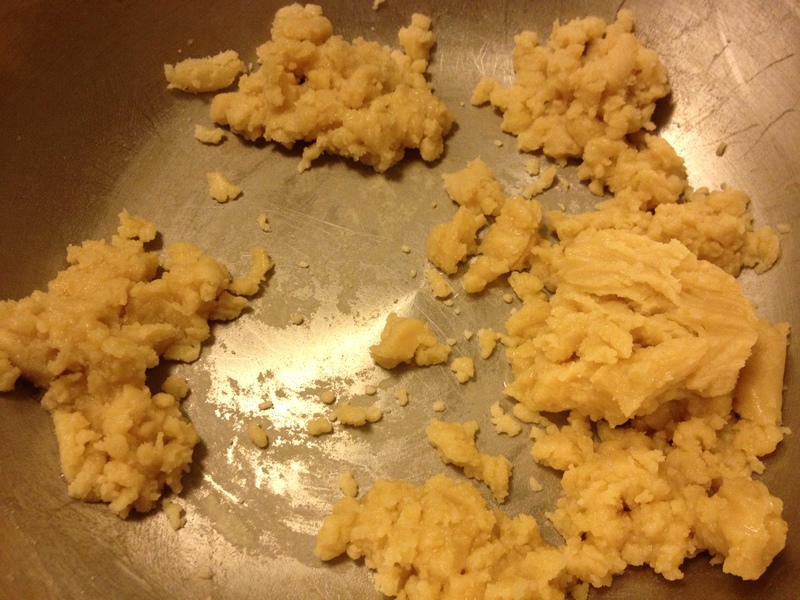 Once butter is melted, whisk in 6 tablespoons of flour until smooth. Once smooth, whisk in 3 cups of milk (any kind). Tip: Have the milk already measured out so you can add it as soon as the flour is incorporated. The butter/flour mixture can brown very quickly so you want to add the milk before that happens. Taste the sauce and add salt as needed. Turn heat to low. 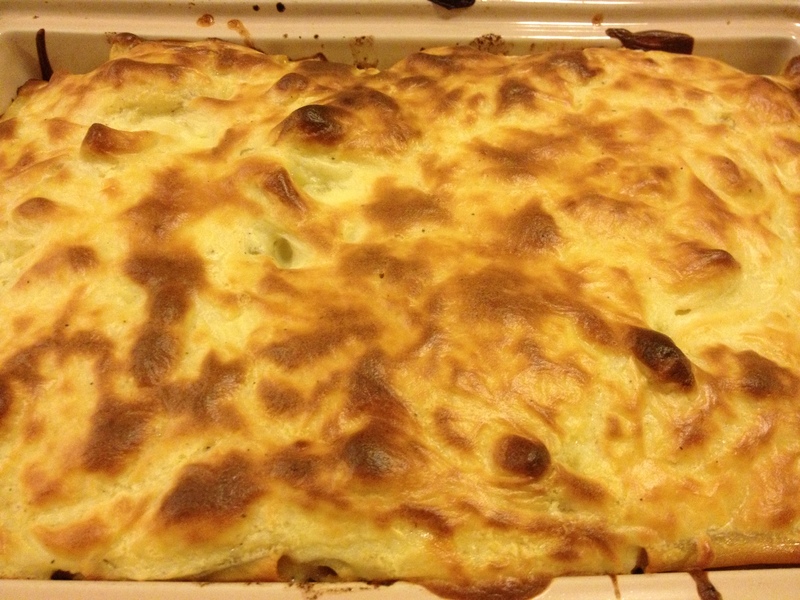 Put a layer of sliced potatoes to cover the bottom of a large casserole. Pour half of the pan sauce over the potatoes to cover. Add grated cheddar cheese to this layer. Add another layer of potatoes. Add the rest of the sauce and another layer of cheddar cheese. Add final layer of potatoes and another layer of cheddar cheese. Sprinkle salt and paprika over the top layer. Once you put potatoes in the oven, you will begin prepping the stuffed peppers. 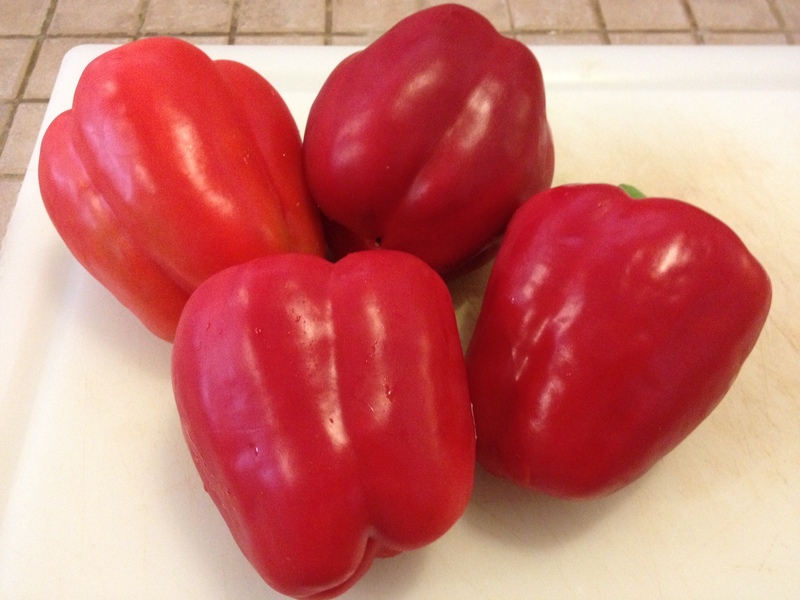 You will need 5 red peppers to make 10 servings. Slice each pepper in half. Keep the stem in place if you can as it gives the plate a great look. 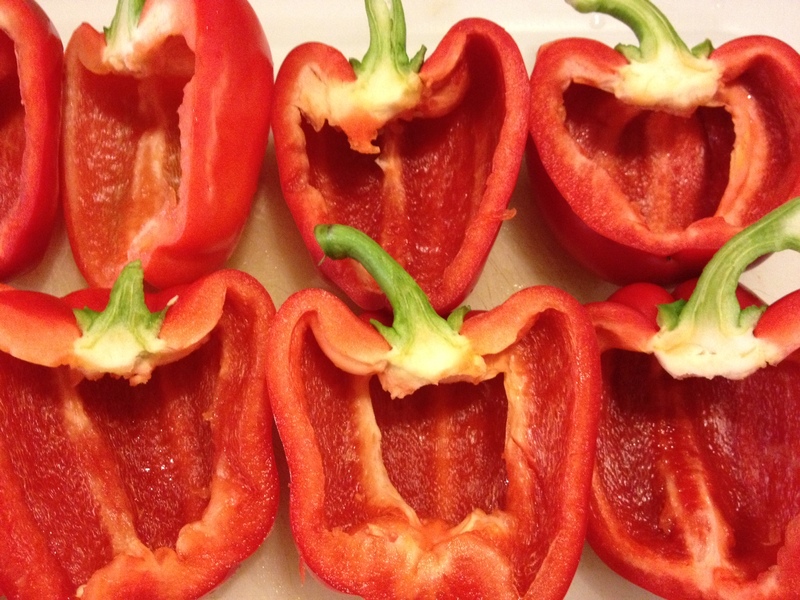 Remove the seeds from inside of each pepper. Tip: I just use a medium side spoon and scrape the inside. Next, mince 3 garlic cloves and 4 tablespoons of Kalamata olives (if you don’t like olives, just omit them). Dice five tomatoes. Mix the garlic, olives and tomatoes together in a bowl. Spoon the tomato mixture into each of the pepper halves. Sprinkle the halves with feta cheese. Drizzle the peppers with olive oil and sprinkle with salt and pepper. Bake for 45 minutes at 350 degrees (until peppers are soft and browned without being mushy). On to my favorite part of the meal; the sauteed mushrooms. I love mushrooms so much and I found a great way to serve them as a side dish. You will need 64 ounces of mushrooms. This can be eight 8-ounce packages, or 4 16-ounce packages, whichever is cheaper. Make sure the mushrooms are whole, not sliced. Rinse the mushrooms. Heat olive oil in a large skillet over medium-high heat. Place the mushrooms button side down. Cook until brown (about 5 minutes). 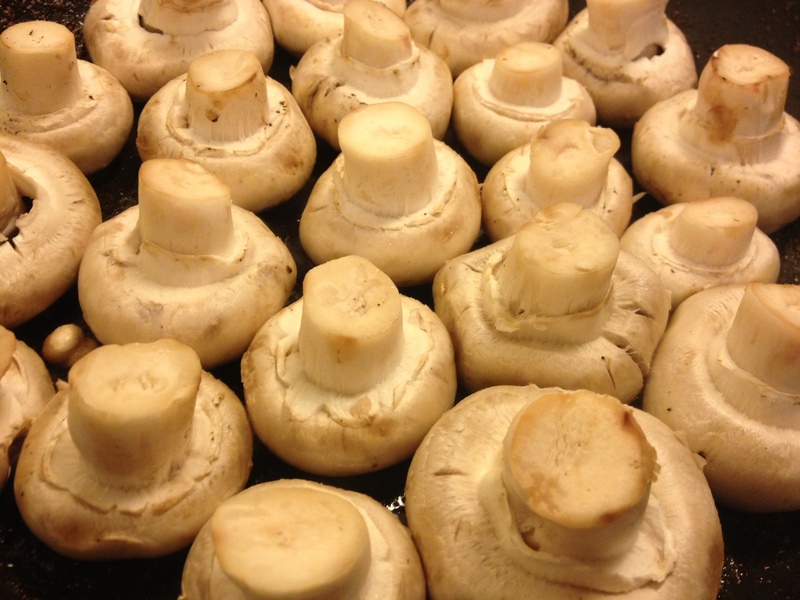 Once the tops are golden brown, place the mushrooms on their sides. Add 1/4 cup of white wine to the skillet. Squeeze a lemon over the top of the mushrooms. Sprinkle with garlic salt. Cook mushrooms for another 5 minutes, continuing to shake the pan to rotate the mushrooms. Cook until tender. Tip: Taste, taste, taste! Once the mushrooms begin to soften, go ahead and try one. If you like yours saltier, add more salt. If you like lemon, add more lemon. Mushrooms can taste like whatever you want, so make sure you add enough flavor to your liking. Repeat these steps until you have all the mushrooms you want! I found that 64 ounces made about 10 servings. When your timer for the brisket goes off, remove it from the pot and place on a large plate. Cover with tin foil and let rest for at least 15 minutes (preferably 30 if you have the time). After the meat has rested, cut the meat into slices. Tip: Always cut across the grain to make sure the meat stays nice and juicy. What this means is, look at the meat and see which way the fibers are going. Do not cut the same direction as the fibers, but cut perpendicular to them. Place all of these dishes on one or two large platters. The colors go great together. 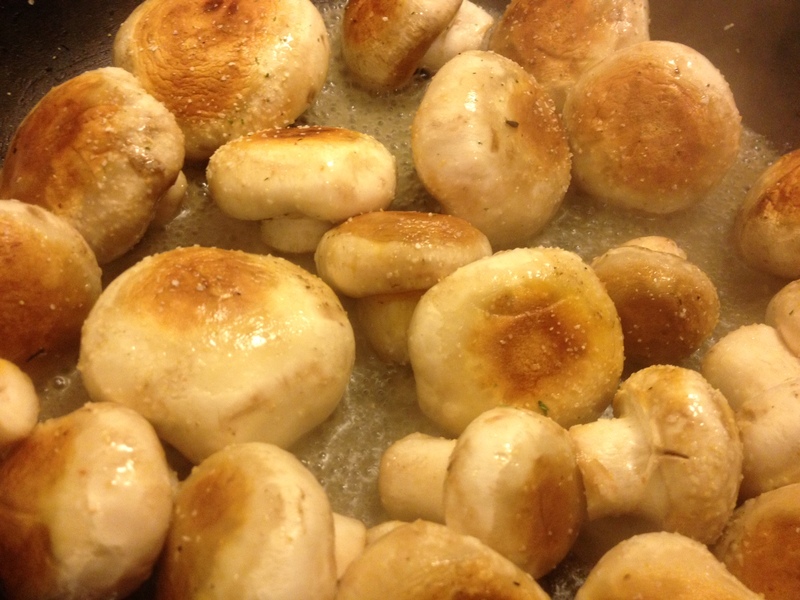 Sprinkle some parsley over you mushrooms to give them a nice pop. Don’t forget to drizzle some of the juices from the brisket onto to the meat. There’s a ton of flavor in there! It was a wonderful meal! 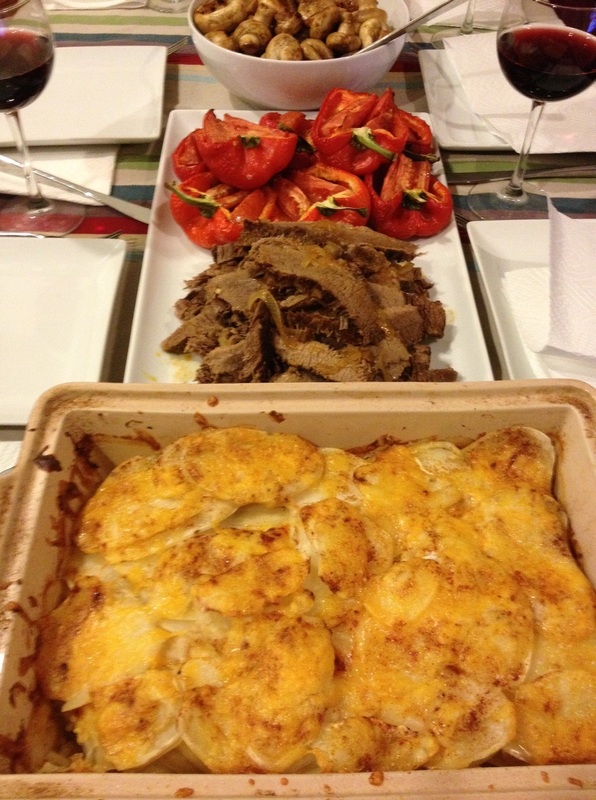 I was very pleased with every dish and will make these all again in the future. Happy New Year!